Earlier – Original Park Sign installed. 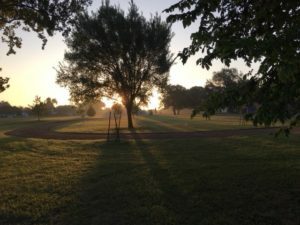 2005 – Fifteen trees are planted on the north side of the park, along Wooten Drive, with the help of Austin Parks Foundation and area residents. 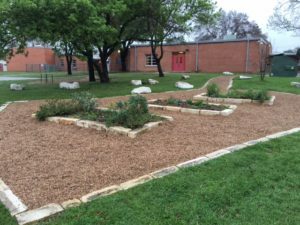 October 2010 – With funding from a grant through Texas Action for Healthy Kids, a Wooten Elementary School nurse heads a project to have three raised planting beds installed near the school as well as a crushed granite walking trail. 30 volunteers, including Wooten residents, assist with the work. 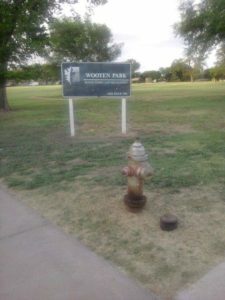 November 2010 – Two Mutt Mitt stations are installed in Wooten Park. January 2013 – WNA President, Joshua Merritt, proposes a (new) Park Advocacy Group be formed. March 2013 – Wooten participates in our first APF sponsored It’s My Park Day (IMPD) since 2011. Work includes the mulching of the fifteen trees along Wooten Drive, new distribution of crushed granite on the walking trail, painting three picnic tables and park signs as well as trash pick up. Received an APF mini-grant for $250.00. We had 18 volunteers. 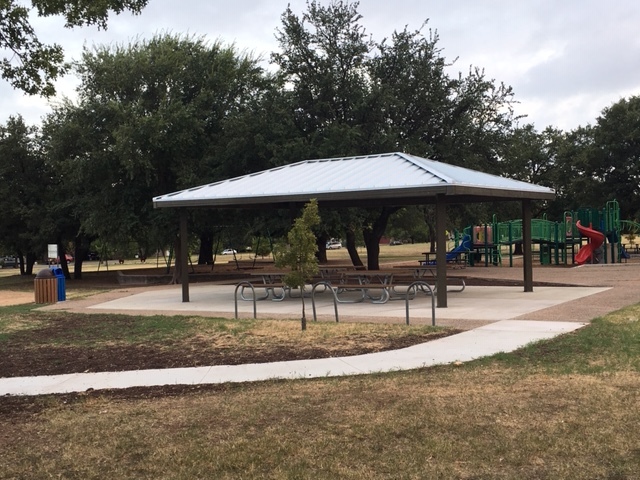 August 2013 – Park benches are replaced by the Austin Parks and Recreation Department. 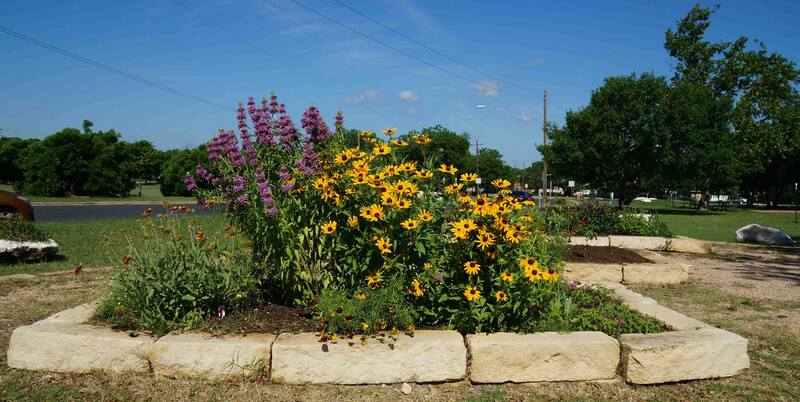 November 2013 – Keep Austin Beautiful donates plants including: Wildflower Mixes, Turk’s Cap, TX Lantana, American Beautyberry, Salvia, Rose Mallow, Prairie Fleabane and Seep Muhly which are all planted in the raised beds near the elementary school. TreeFolks plants 70+ trees throughout the park! Area residents as well as volunteers from across the city help with the effort. The City of Austin agrees to water them for the next three years. March 2014 – It’s My Park Day! 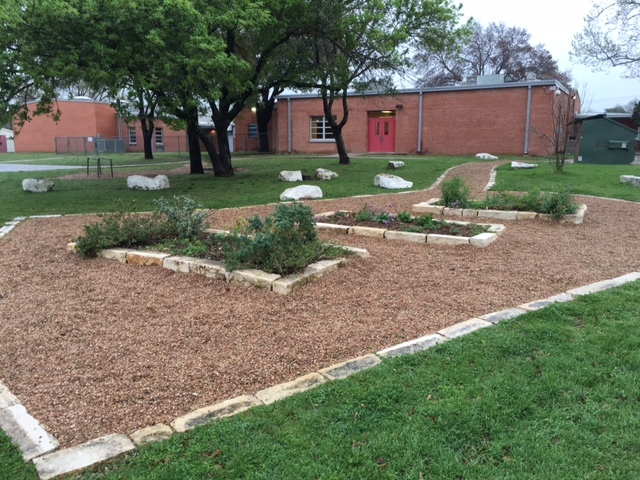 Work is done on the raised bed/butterfly garden area located near Wooten Elementary School. Additionally, new soil was added to the exposed roots of the newly planted trees. A group worked on graffiti abatement for the playground. We had 30 volunteers. April 2014 – Park Committee promotes a neighborhood-wide garage sale in order to raise money. 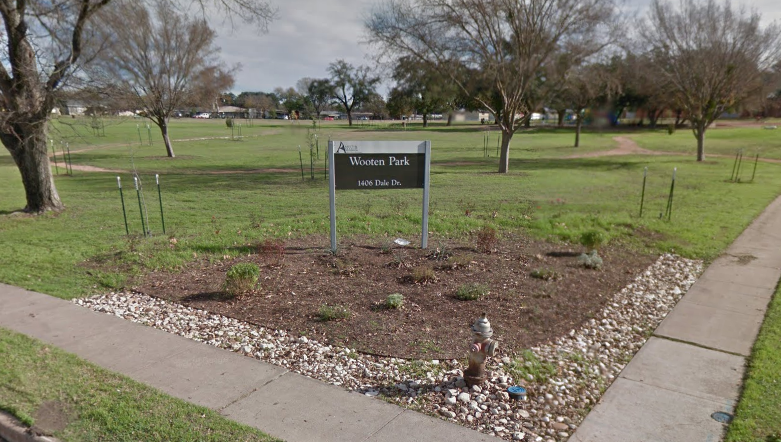 October 2014 – The Wooten Neighborhood Park sign, located at the corner of Burrell Dr. and Dale Dr. is replaced! Area is prepped by a handful of neighborhood volunteers and with the help of Redeemer Lutheran’s volunteer groundskeeper, John. Flood mitigation including a rock border and berm is included in the design. November 2014 – Plants are included in the recently prepped area around the new sign! December 2014 – Neighborhood landscaper donates sixteen knock-out rose bushes and has his crew plant them along the berm. March 2015 – It’s My Park Day! We weeded and planted new plants in the beds in the butterfly garden area and re-graveled around the beds. Additionally, we weeded the corner sign garden. We had 17 volunteers. April 2015 – Weeded corner bed and planted nine Lantana plants that were donated by a resident. Finished weeding and spreading pea gravel around raised beds. May 2015 – Water fountain near Northwest corner of the park is repaired and working! June 2015 – National Trails Day –General clean-up of washed out gravel due to the recent Memorial Day floods and mulched all the trees and performed root collaring on trees as needed. July 2015 – Major weeding of raised bed area with the help of ten Wooten residents. Two residents donate and spread 18 bags of mulch on corner bed. 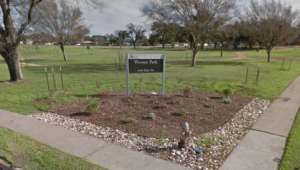 January 2016 – Park Committee members meet with representatives from PARD, Wooten Elementary/AISD and Redeemer Lutheran Church to discuss vision for pavilion at Wooten Park. March 2016 – It’s My Park Day! More weeding and spreading of pea gravel around the raised beds. Also added more plants to the corner bed. Small group of neighbors work on corner bed, laying down newspaper to help mitigate weeds and grasses. Received an APF mini-grant for $250.00. We had 24 volunteers. Wooten Elementary Garden after It’s My Park Day! April 2016 – We receive an estimated cost for a pavilion from PARD. June 2016 – Yard signs for fundraising arrive. They were sold for a $50 donation. August 2016 – Weeding of corner bed and rocked area with help of four Wooten residents. Submitted APF Funds Management Request Form and signed Agreement. December 2016 – The first annual Carols and Cocoa raised money for the Park Fund. Local businesses donated supplies and neighbors joined us in the park to drink hot cocoa and sing holiday carols. March 2017 – It’s My Park Day / Spring! Weeded and pruned corner bed and butterfly gardens. Added plants and mulch. 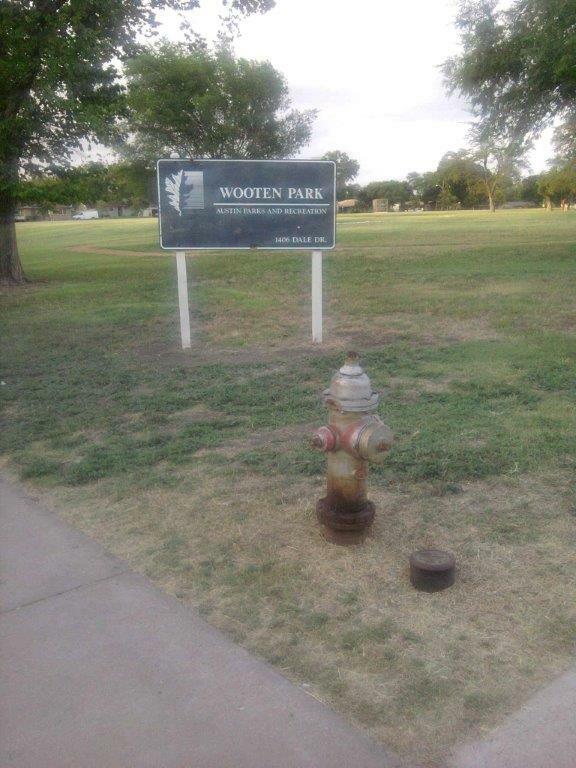 Signs reminding people that Wooten Park is not an off-leash dog park were installed by PARD. May 2017 – Handful of residents weed and prune corner bed. 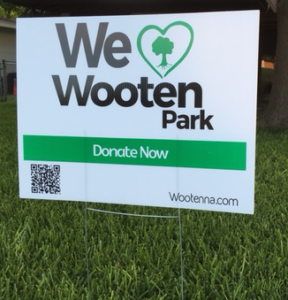 June 2017 – Wooten Park Improvement Committee receives word that we have been selected as the recipient of a grant awarded by APF which will be used to build a pavilion near the playground! Wooten Park Improvement Committee meets with PARD to discuss plans for pavilion as well as other improvements to park. Old water fountains are replaced with dual level fountains – one near NW corner of park and the other near the playground. Trail near playground area regraded and widened before crushed granite is laid. Area formerly containing nothing but pea gravel is transformed into a sandbox as suggested by several neighbors. 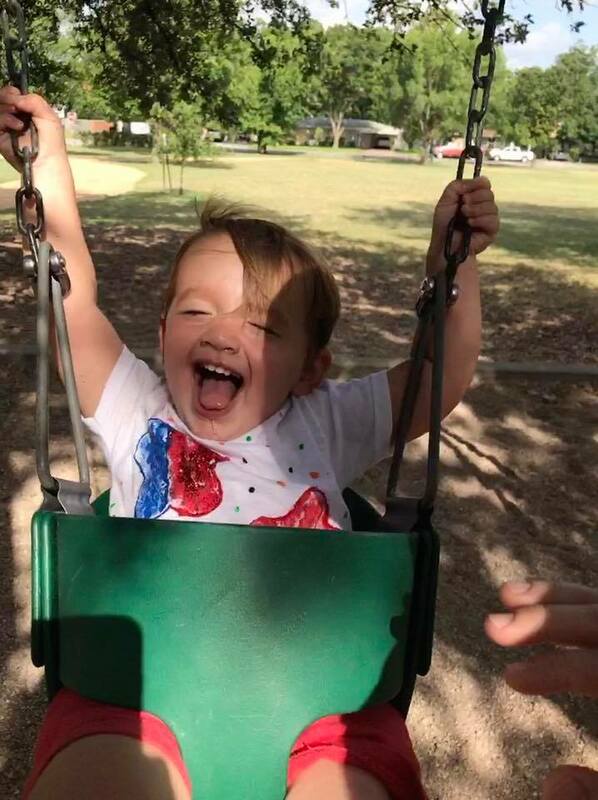 July 2017 – New toddler swings are installed. Park Committee joins APF at City Hall to meet with Council Member Pool to help advocate for more park funding. November 2017 – Participated in APF’s bi-annual It’s My Park Day. Our group of volunteers pruned plants in the corner bed and prepped plants and trees for winter by mulching. We also removed all the river rocks bordering the corner bed and laid down doubled 6 mil black plastic before covering with all of the existing rocks + an additional truckload in an effort to combat weeds and grass. 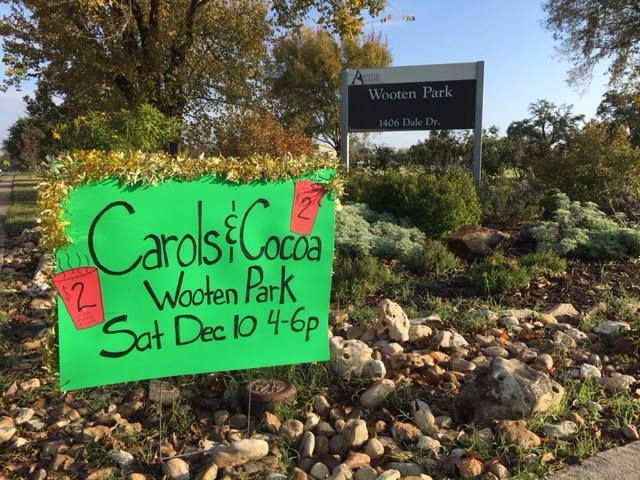 December 2017 – Second Annual Carols and Cocoa fundraising event held in park. March 2018 – This It’s My Park Day marked the five-year anniversary of our participation in APF’s city-wide event! 21 volunteers helped prune and weed in and around the 3 raised pollinator beds as well as the corner bed. 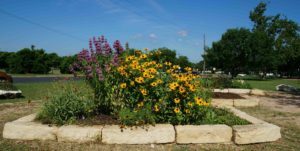 We planted additional host plants including fennel, parsley and milkweed and totally reworked one bed before planting indigo spire, lantana and Blackfoot daisies, which are all nectar plants. COA Parks and Rec re-grade walking path before laying down more crushed granite! April 2018 – Work begins on shade pavilion! August 2018 – After some delays, the pavilion is FINISHED! In addition to the shade structure, we now have 4 additional picnic tables, two trash cans (including one for recyclables) and new sidewalks to make it ADA compliant. 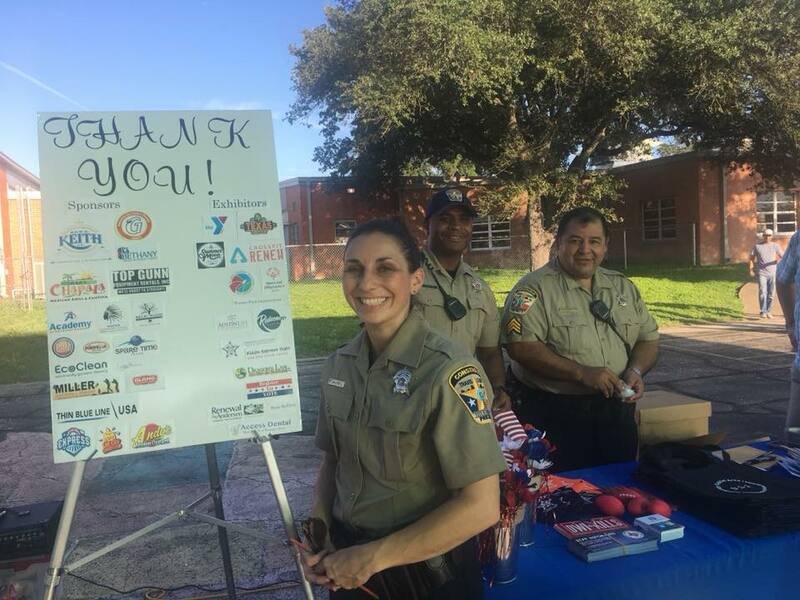 October 2018 – The Travis County Constable’s Office hosted a neighborhood-wide National Night Out Event. There were vendors on hand plus activities for the kids including train rides and fire truck tours. Our hosts served hot dogs, chips and drinks and our neighbors from Redeemer manned a very popular snow-cone stand. 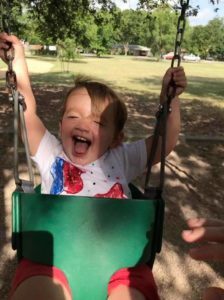 November 2018 – It’s My Park Day, Fall Edition. Hard working Wootenites got A LOT done during this city-wide event! They mulched trees, weeded the corner bed and worked in the butterfly garden near the pavilion. 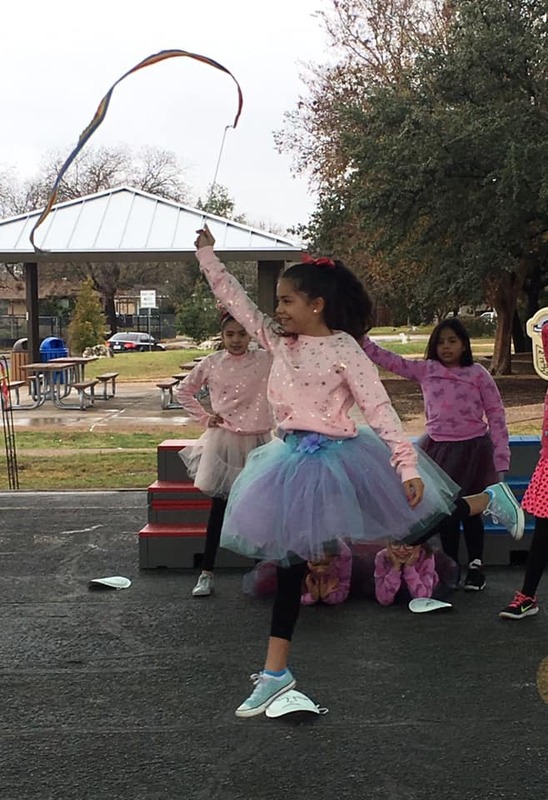 December 2018 – The Austin Parks Foundation hosted a ribbon cutting ceremony, to official christen the new pavilion. Various speakers were on hand, including Council Member, Leslie Pool, and entertainment was provided by the Wooten Elementary choir, cheerleaders and dance squad. Immediately following the dedication, we held our 3rd Annual Carols and Cocoa fundraising event. Thanks to our sponsors: American Party Rental, Arlan’s Market and Genuine Joe’s for their support again this year.